The sanctuary management plan serves as a non-regulatory policy framework for addressing the issues facing the sanctuary over the next five years. It lays the foundation for restoring and protecting the sanctuary‘s ecosystem; details the human pressures that threaten the qualities and resources of the sanctuary; and recommends actions that should be taken both now and in the future to better manage the area and resources. 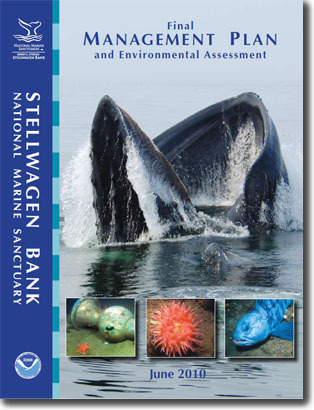 Interested individuals may request electronic versions of the plan on CD by contacting the sanctuary offices by phone at 781-545-8026, by fax at 781-545-8036, by email at stellwagen@noaa.gov or by mail at SBNMS, 175 Edward Foster Road, Scituate, MA 02066. Printed copies of the draft management plan will be sent to public libraries, academic institutions, sanctuary education and research partners, and government offices in the sanctuary region. Please note, to view in PDF format, you will need the free Adobe Acrobat reader. Click on a document link (Mac users, click and hold) to download the document.